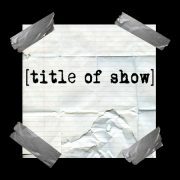 [Title Of Show] is a one-act musical with music and lyrics by Jeff Bowen and book by Hunter Bell, both of whom also played themselves in the original production, accompanied by two actress friends, Heidi Blickenstaff and Susan Blackwell. The story documents the creation and production of the show itself for the New York Musical Theatre Festival where it premiered in 2004. It later ran off-Broadway at the Vineyard Theatre in 2006, and subsequently on Broadway at the Lyceum Theatre in 2008. Bell, Bowen and director Michael Beresse all won Obie awards for the off-Broadway production, as well as Bell receiving a Tony for Best Book of a Musical. There have been several regional productions of the show and it has become popular with students and amateur theatre companies.